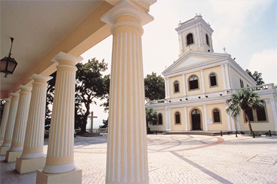 Although Taipa Island is considered the smallest island in Macau, there are plenty of "UST SEE" attractions for all types of guests to visit. Golden 4-Face Buddha Shrine. Closest to the hotel is the Golden 4-Face Buddha Shrine. It is less than a two-minute walk. The four faces represent four qualities of the earth, directed in four directions. He holds in his hands the Vedas (ancient book of wisdom and learning), a string of pearls for counting time, a sacrificial spoon symbolic of spiritual nature. The fourth hand is usually raised in blessing. He also carries water in a Kamandalu (water pot), indicating that the universe has evolved from water. It is believed that those who pay homage to the Buddha worship all four sides of the statue in clockwise direction. Macau Olympics Stadium. Facing MJC, turn to your left and walk for around 5 minutes. The big sporting arena you will face is actually the Macau Olympics Stadium. This is where the 4th East Asian Games was held in 2005. It can seat 15,000 spectators and it has two playing fields for soccer, hockey, and track and field, plus two gymnasiums for basketball, volleyball, and gymnastics. The stadium has also been used for other local and international sports events, gala occasions, and pop concerts. Taipa Village & Food Street. From the sporting complex you can walk farther for around 5-10 minutes and you will be in the famous village. Chinese shop-houses, Portuguese-style offices, small temples and a former firecracker factory share the narrow streets and alleys of this busy, colorful place. Hanging flower baskets and old-fashioned street lamps make it an appealing place to stroll, and the numerous restaurants along the Rua da Cunha (known as Food Street) are popular destinations for Portuguese, Macanese, Chinese, Spanish or Italian cuisine. Taipa Flea Market. Just off the village center in Bombeiros Square is a place where you can purchase Macau souvenirs to take home for your friends and loved ones. Snap up that something special toys, traditional crafts amongst others. Our Lady of Carmel, Carmel Garden & Taipa Praia. On a hill to the east of the village looking towards the causeway and Coloane Island is Our Lady of Carmel, a neo-classical church built in 1885. Paths wind down from the church square through the hillside Carmel Garden to the Avenida da Praia, a tree-lined pedestrian area that harks back to the early days of the 20th century. 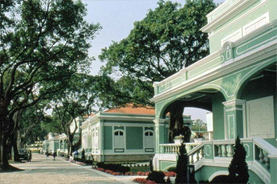 Taipa Praia is one of the best places to catch a cooling breeze in summer, and an ornate kiosk with cafe tables provides refreshments.